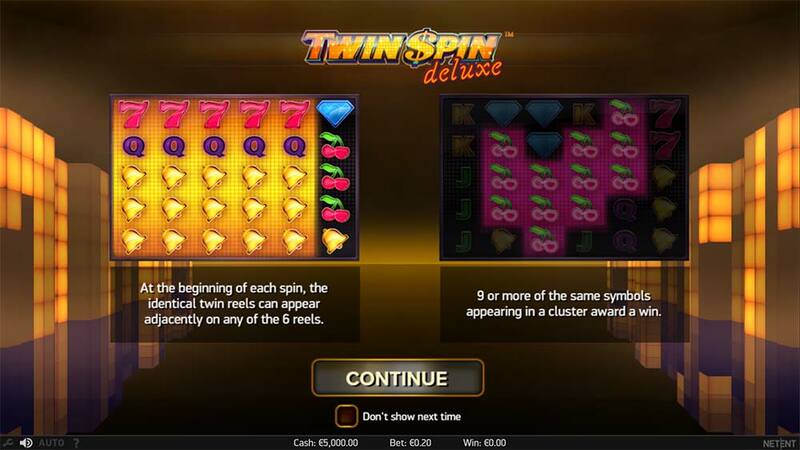 Play the New Twin Spin Deluxe Slot Exclusively at Unibet Casino! Unibet Casino has just added the new version of the popular Twin Spin slot titled Twin Spin Deluxe to their casino and has exclusive access to this online slot for the next 6 months meaning if you want to check it out you then Unibet Casino will be your destination. 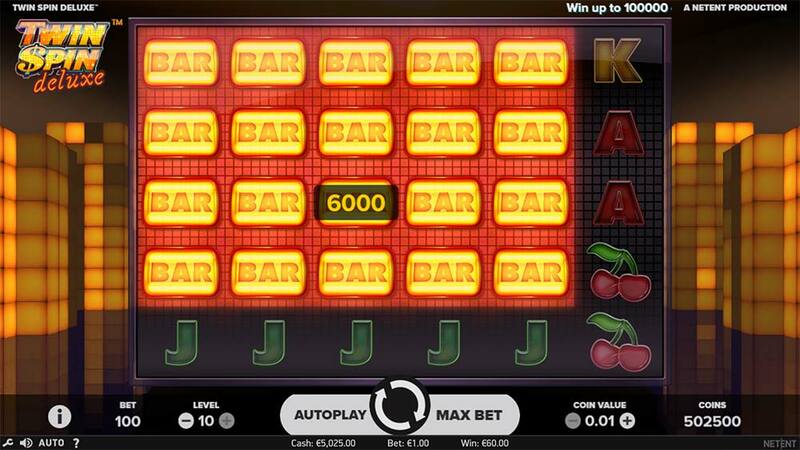 Twin Spin Deluxe is a slightly larger version of the original with a 6×5 reel layout, the linked reels feature is still in place and can sync up all 6 reels but the old 243-way payline format has been replaced with a new “cluster pays” style seen previously on slots like Aloha Cluster Pays. 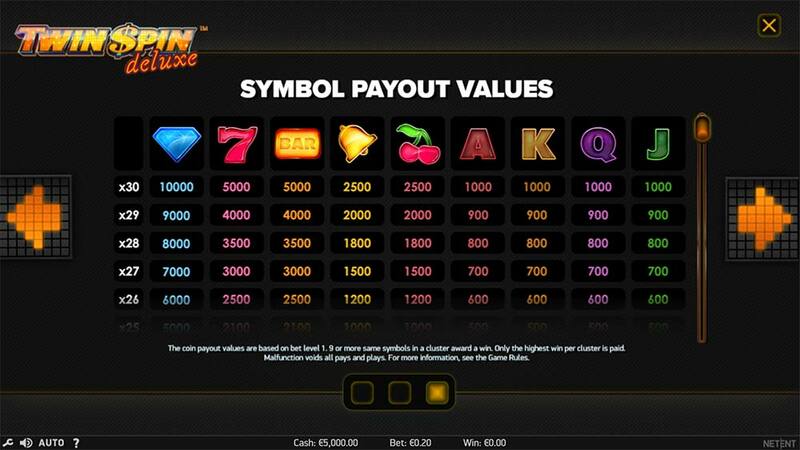 To score wins on this slot you must match up at least 9 matching symbols in a cluster on the reels (horizontally or vertically adjacent to a matching symbol), there are at least 2 linked reels on every spin and these will always land with matching symbols. During any spin, the number of linked reels can increase up to the maximum 6 reels, and if this occurs you want the reels to stop with as many matching symbols as possible in a cluster, a full screen of matching symbols is possible during this feature. 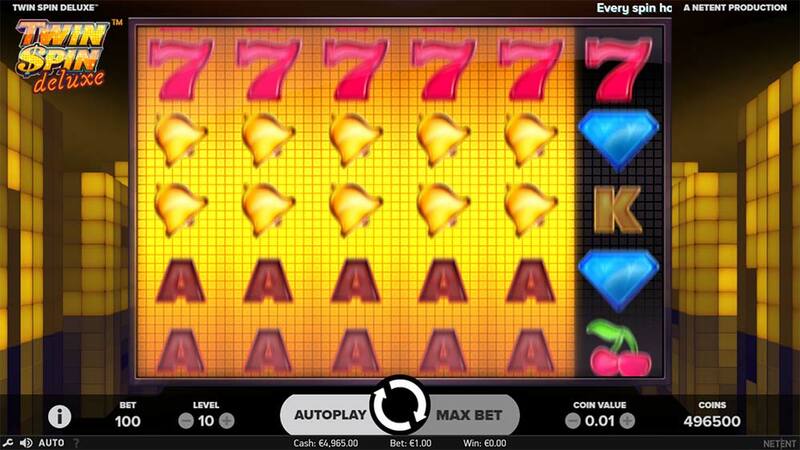 With no bonus round on offer, the gameplay is as simple as the original, with the biggest wins coming when multiple reels become linked. To celebrate the exclusive launch of this new slot, Unibet Casino is running several different promotions with huge cash prizes on offer as well as a real diamond up for grabs. Guaranteed 80 Free Spins – Starting on the 6th September – Players will be given 80 free spins to check out this new slot over a 4 week period. Win a 2ct diamond worth €10,000 – Starting on the 6th September – Top prize – real 2ct diamond worth €10,000. 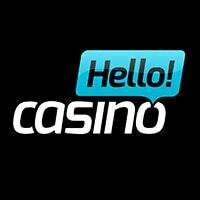 You can check out the terms and conditions on the Unibet Casino promotions section, and it worth noting that mobile play will earn you more tickets for the Diamond Draw! Play Twin Spin Deluxe Now! 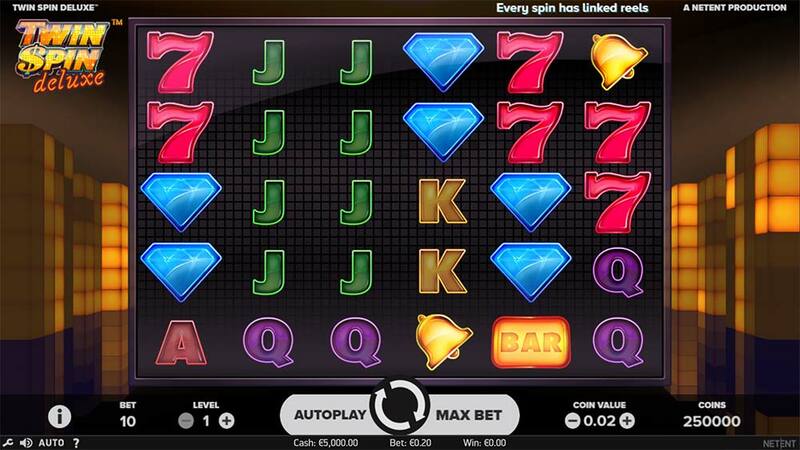 Twin Spin Deluxe could have been an awesome successor to the popular Twin Spin slot, with a larger number of reels suggesting even more volatility, however with the change to cluster pays format the overall feel of this slot is somewhat lacking and quite possibly less volatile. The linked reels feature will always be exciting, but given the cluster pays style it’s quite possible to get 4 linked reels and not actually create any winning combination which is very disappointing when playing. 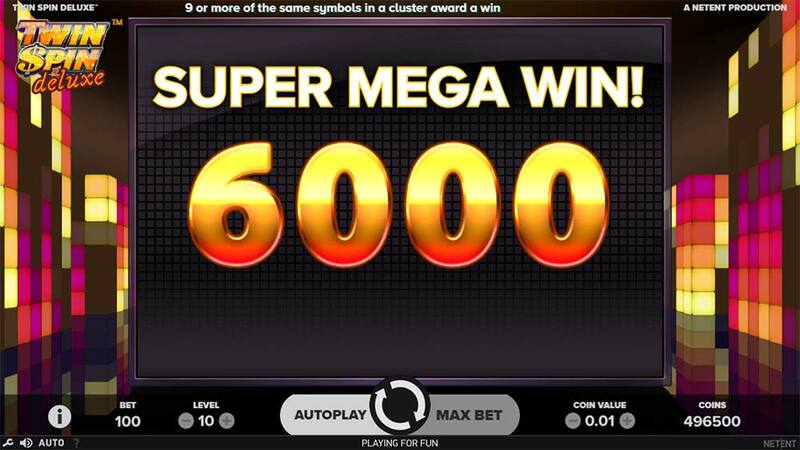 The major redeeming feature currently to this exclusive slot is the number of great promotions running at Unibet Casino that focus on this and the regular Twin Spin slot, apart from that, the slot doesn’t feel like an improvement to the original to us.